Cruise from the iconic city of Paris and see famous sights including the Eiffel Tower, before you continue on to Vernon and Rouen as well as a visit to the home of Claude Monet in Giverny. Fly from the UK to Paris, the city of romance. You will be met at the airport and then transferred to your river ship, docked on the Seine River. Enjoy some time to settle in before getting to know your fellow travellers and APT Cruise Director at a Welcome Reception. FREEDOM OF CHOICE: This morning, discover a different side of Paris during your selected sightseeing activity. Perhaps join a culinary walking tour to sample a delectable range of Paris’ fine food. Alternatively, visit Versailles and discover the magnificent splendour behind Louis XIV’s transformation of the Château de Versailles. Or, perhaps soak up the atmosphere as you explore the Montmartre district and admire the Sacre-Coeur Basilica. SIGNATURE EXPERIENCE: Tonight, enjoy a fabulous extravaganza at the Lido de Paris. Be entertained by the Bluebell Girls and Lido Boys as they take you on a glittering journey filled with incredible set designs and dynamic dancing. Later this evening, set sail for Vernon. 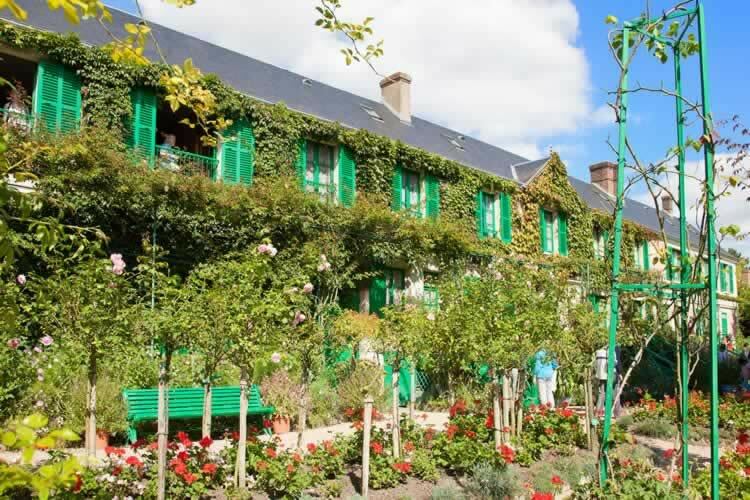 Dock in Vernon and travel to Giverny where you’ll visit Claude Monet’s house and gardens, taking in scenes that inspired many of the artist’s famous paintings. Later, enjoy a Gala Welcome Dinner. FREEDOM OF CHOICE: Disembark in Le Havre and travel to the pretty port town of Honfleur for a tour. During this excursion, see the old and picturesque port area and visit Saint-Catherine’s Church, the largest wooden church in France. FREEDOM OF CHOICE: Arrive in the old fishing village of Caudebec-en-Caux and choose your sightseeing option. Perhaps join a full day excursion tracing the events of D-Day – June 6th 1944 – taking in a number of beaches and significant sites. Or, a visit to the Pays d’Auge region may be more your style as you admire typical Norman villages. Otherwise, indulge in a calvados and delicious cheese tasting on board your luxury river ship. FREEDOM OF CHOICE: Perhaps spend a full day exploring the battlefields of the Somme. Visit the Franco-Australian Museum, then proceed to Pozieres and the Thiepval Memorial – which has inscribed the names of over 72,000 officers and men of the United Kingdom and South African forces who were reported missing in the Battles of the Somme of the First World War. Alternatively, a city tour will take you to some of Rouen’s most enthralling and iconic sights, including the Notre Dame Cathedral, Gros Horloge and the Market Square where Joan of Arc was burnt at the stake. Alternatively, enjoy a round of golf. SIGNATURE EXPERIENCE: Later, be welcomed at Château de Vascoeuil by the current owner. Take a tour of the beautiful castle and gardens, which houses a permanent exhibition of more than 50 wonderful contemporary art sculptures. You will then enjoy a private Cocktail Reception whilst you’re entertained by local performers. FREEDOM OF CHOICE: Stop at the picturesque town of Les Andelys. Here, the more active may like to embark on a walk up to the ruins of Château Gaillard for stunning views of the Seine River. Others may prefer a leisurely excursion to Château de la Roche-Guyon, originally built in the 12th century to control a river crossing of the Seine. Otherwise, enjoy an onboard impressionist water-colour painting class. This evening, set sail for Paris. Today your Romantic Seine journey draws to a conclusion. Farewell your wonderful crew as you disembark your ship after breakfast and are then transferred to the airport for your return flight to the UK.